Matthew Apgar - mapgar@shawmedia.com Ariel Ries (right), owner of Fargo Skateboarding, helps Carmella Spagnola of Jacobs High School, 17, operate a drill press to create jewelry out of broken skateboards on Thursday, Oct. 12, 2017 at Fargo Skateboarding in DeKalb. Students from District 300, including Jacobs, Hampshire, and Dundee-Crown High Schools, were able to take a trip to DeKalb to learn the repurposing craft from Fargo owner Ariel Ries due to an annual D-300 Foundation grant. 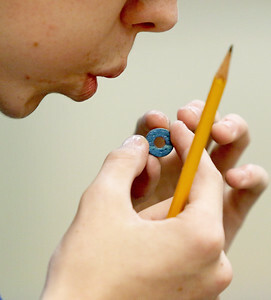 Matthew Apgar - mapgar@shawmedia.com Hampshire High School sophomore Ryan Hopfner, 15, blows on the nail polish he used on a circular piece of skateboard that he is turning into a necklace charm for his girlfriend on Thursday, Oct. 12, 2017 at Fargo Skateboarding in DeKalb. "She always steals my dogtag, so this is something she can take," Hopfner said. Students from District 300, including Jacobs, Hampshire, and Dundee-Crown High Schools, were able to take a trip to DeKalb to learn the repurposing craft from Fargo owner Ariel Ries due to an annual D-300 Foundation grant. 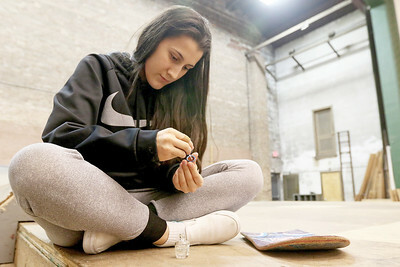 Matthew Apgar - mapgar@shawmedia.com Jacobs High School junior Chloe Frank, 16, uses clear nail polish to coat a ring she created out of a broken skateboard on Thursday, Oct. 12, 2017 at Fargo Skateboarding in DeKalb. Students from District 300, including Jacobs, Hampshire, and Dundee-Crown High Schools, were able to take a trip to DeKalb to learn the repurposing craft from Fargo owner Ariel Ries due to an annual D-300 Foundation grant. Matthew Apgar - mapgar@shawmedia.com Ariel Ries (center left), owner of Fargo Skateboarding, helps students operate a drill press to create jewelry out of broken skateboards on Thursday, Oct. 12, 2017 at Fargo Skateboarding in DeKalb. Students from District 300, including Jacobs, Hampshire, and Dundee-Crown High Schools, were able to take a trip to DeKalb to learn the repurposing craft from Fargo owner Ariel Ries due to an annual D-300 Foundation grant. Matthew Apgar - mapgar@shawmedia.com Hampshire High School senior Samantha Huerta, 17, uses clear nail polish to coat a ring she created out of a broken skateboard on Thursday, Oct. 12, 2017 at Fargo Skateboarding in DeKalb. Students from District 300, including Jacobs, Hampshire, and Dundee-Crown High Schools, were able to take a trip to DeKalb to learn the repurposing craft from Fargo owner Ariel Ries due to an annual D-300 Foundation grant. 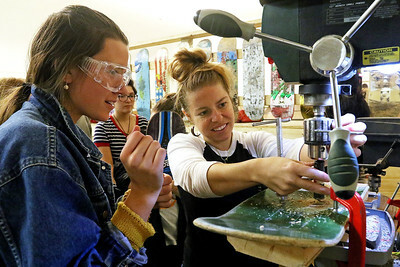 Matthew Apgar - mapgar@shawmedia.com Ariel Ries, owner of Fargo Skateboarding, smiles as she helps instruct students create jewelry out of broken skateboards on Thursday, Oct. 12, 2017 at Fargo Skateboarding in DeKalb. Students from District 300, including Jacobs, Hampshire, and Dundee-Crown High Schools, were able to take a trip to DeKalb to learn the repurposing craft from Fargo owner Ariel Ries due to an annual D-300 Foundation grant. Matthew Apgar - mapgar@shawmedia.com Jacobs High School senior Bridget Vrtis, 17, smiles as she operates a drill press to remove a a core from a broken skateboard, which would then be turned into a piece of jewelry on Thursday, Oct. 12, 2017 at Fargo Skateboarding in DeKalb. Students from District 300, including Jacobs, Hampshire, and Dundee-Crown High Schools, were able to take a trip to DeKalb to learn the repurposing craft from Fargo owner Ariel Ries due to an annual D-300 Foundation grant. 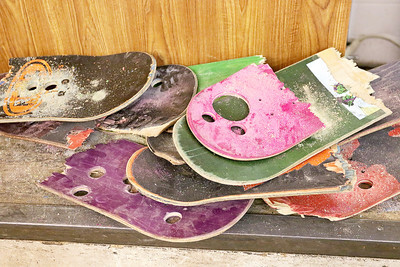 Matthew Apgar - mapgar@shawmedia.com Broken skateboards are piled up with holes drilled into them, showing their nine layer cores of canadian maple on Thursday, Oct. 12, 2017 at Fargo Skateboarding in DeKalb. 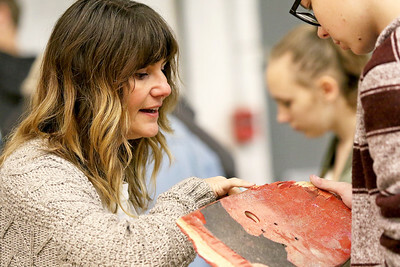 Students from District 300, including Jacobs, Hampshire, and Dundee-Crown High Schools, were able to take a trip to DeKalb to learn the repurposing craft from Fargo owner Ariel Ries due to an annual D-300 Foundation grant. 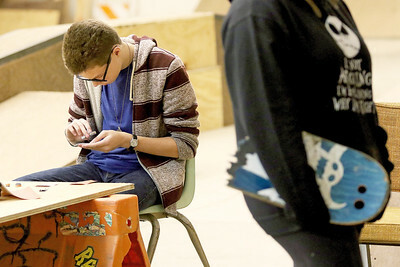 Matthew Apgar - mapgar@shawmedia.com Hampshire High School art teacher Laura LaRue shows sophomore Ryan Hopfner, 15, the layers of canadian maple plywood that make up a skateboard on Thursday, Oct. 12, 2017 at Fargo Skateboarding in DeKalb. Students from District 300, including Jacobs, Hampshire, and Dundee-Crown High Schools, were able to take a trip to DeKalb to learn the repurposing craft from Fargo owner Ariel Ries due to an annual D-300 Foundation grant. Matthew Apgar - mapgar@shawmedia.com Hampshire High School sophomore Ryan Hopfner, 15, sands down a piece of broken skateboard as he turns it into a piece of jewelry on Thursday, Oct. 12, 2017 at Fargo Skateboarding in DeKalb. Students from District 300, including Jacobs, Hampshire, and Dundee-Crown High Schools, were able to take a trip to DeKalb to learn the repurposing craft from Fargo owner Ariel Ries due to an annual D-300 Foundation grant. Matthew Apgar - mapgar@shawmedia.com Jacobs High School senior Bridget Vrtis, 17, smiles as she talks with friends while waiting in line to use a drill press to turn a broken skateboard into a piece of jewelry on Thursday, Oct. 12, 2017 at Fargo Skateboarding in DeKalb. 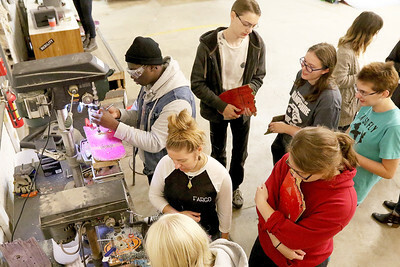 Students from District 300, including Jacobs, Hampshire, and Dundee-Crown High Schools, were able to take a trip to DeKalb to learn the repurposing craft from Fargo owner Ariel Ries due to an annual D-300 Foundation grant.